I'm not sure why I've not been to one of these previously. Glamgeek's school hosted a trunk or treat tonight, where people decorate their car trunks and hand out candy from them. Some were very clever, and had people who hid in the vehicle (SUV's/vans) and when a kid would go to take a candy, they jump forward or grab the kid's arm. It was also nice to know who was participating, unlike door to door trick or treating, where some folks forget/refuse to turn off their porch light, so you knock/ring and wait. And wait. Sometimes, just when you're giving up, the door opens. Either way, you knew that everyone there wanted to be there, and welcomed you over. It was refreshing! 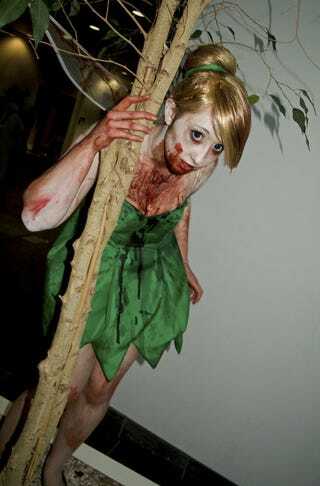 Glamgeek is going as Marceline tomorrow night, so tonight she wore her old Tink dress, and we did zombie makeup. She makes an adorable zombie. We also had the newbie with us, he wore his Jake costume, he was more excited about discovering a lollipop, and that his little girlfriend was there. He kept squeezing, loudly. She just stared or laughed, like, dude, chill. I missed you too and all, but you don't gotta scream it. The newbie's costume has matching socks, which we took off of him before letting him run around with his friend. Today was a two bath day. My team lost the world series, *le sigh. Good games, Boston. Watch out next year! Tomorrow's gonna be a busy, busy day! I'm so excited! Sweet dreams, gt (I'm hoping I fall asleep in the next half hourish). Eta—top photo is just a Google grab. Just a similar idea to glamgeek's costume.